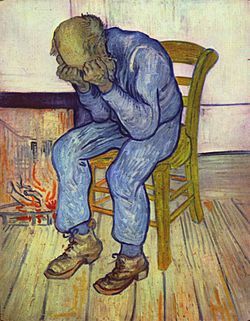 Definition of Depression Van Gogh 1890 – While we see a visual definition of depression, there are strategies to effectively fight and manage your depression. Even if that someone is myself. What are the benefits of staying connected? Because I struggle with both depression and obesity, you can get the full story of what works to help depression and/or obesity and what doesn't. You can benefit as a result of my experiences, successes and failures. You can pick up practical strategies and tips for yourself on what works and what does not and make decisions on your own how to help depression and obesity. For this reason I focus on both issues of depression and obesity; how to help depression and how to lose belly fat fast for men and women. Seventeen percent of all children and adolescents in the U.S. are obese. Clearly, obesity affects more people than depression and has reached the point where it is being called a national security risk. But depression has it's own catastrophic consequences and might affect more people than are willing to admit that they are facing that darkness of despair which is understandable. Especially among men who struggle to admit something’s wrong with them or acknowledge something they perceive as a sign of weakness. More than six million American men will have an episode of major depression this year, which is seven percent of the male population. So depression in men really isn’t that rare — it’s just most often ignored and untreated. The unfortunate reality of men and depression is that it’s a secret killer — of their happiness, relationships, and lives. Men in the U.S. are about four times more likely than women to commit suicide, according to the Centers for Disease Control and Prevention. Approximately 20 million people in the U.S. suffer from depression every year. That’s more than twice the population of New York City. Depression and obesity are serious subjects which I aim to treat with the appropriate gravitas and respect. Neither depression or obesity are to be taken lightly and my goal is to both help you, someone you know and myself cope with both and ultimately find the best strategies that we are aware of today. Is there a Cure for Depression or Obesity? While there is no known cure for depression((Jonathan Rottenberg Associate Professor of Psychology, University of South Florida; author, ‘The Depths: The Evolutionary Origins of the Depression Epidemic’)), I have found that there are practical nutritional and exercise strategies which can help depression and work wonders for obesity. I had an unfortunate history of catastrophic negative side effects from medications and I was advised to look into diet and exercise as a treatment for depression. I did so by reading up on as many links as I could find between food and depression and was shocked to find numerous articles which identified several foods like wheat and sugar as substances of interest. As a result of my research, I decided to eat real food daily, which meant for me as little processing as possible and within the span of just ten months, my body responded in a way that I had never before experienced. I can also say that instead of the recurring suicidal ideation I experienced from certain antidepressants, I found that focusing in on diet, exercise and a different way of thinking helped to motivate me to do the best that I could to work on rebuilding my life. 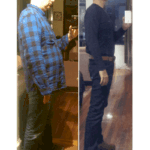 Misery is unmet expectations, so let me set the expectations that I believe are reasonable, if you follow the diet and exercise program that I use for myself, I believe that you can experience a dramatic physical transformation. I have gone from obese to almost at the body fat percentage that I want to be. You can have the expectation that strict adherence to real food like vegetables, seeds, fruits, healthy fats and lean protein and eliminating wheat and other toxins are powerful weapons to melt your belly fat. Adding on to the benefits of deadlifts, squats, pushups and walking will help to tone your new lean build and promote higher levels of testosterone which can only help you in the fight against depression. As far as depression goes, there is no magic bullet, however I believe that you can find some relief from ruminating thoughts of the past, living in the past, obsessive thoughts of self injury and failure and help to motivate yourself to do what you can now to start moving forward an building a new life, as much as is possible. Eating real food, lifting weights (your body weight or barbells/dumbells), walking and thinking better thoughts will help to relieve depression, obesity and anxiety, the big 3 demons that leave us Dead On Arrival at the gate of life. This is how to help someone with depression. Time to slay the demons!